These extinct prehistoric woolly elephants (Mammuthus columbi) roamed the North American continent during the Pleistocene age (last ice age). 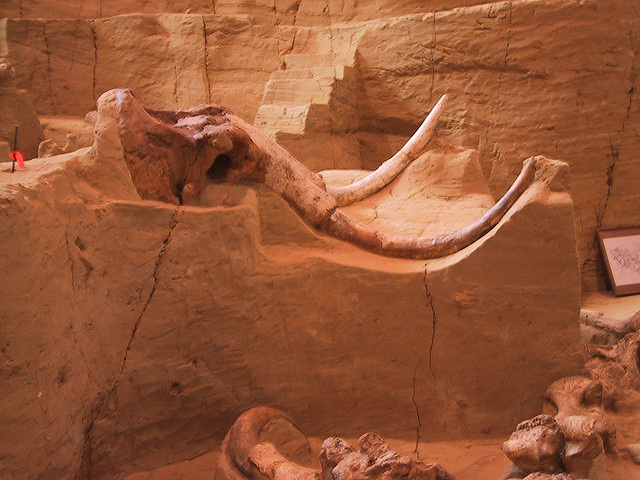 Most mammoths were larger than modern elephants. Their diet consisted primarily of grasses, sedges, and rushes. 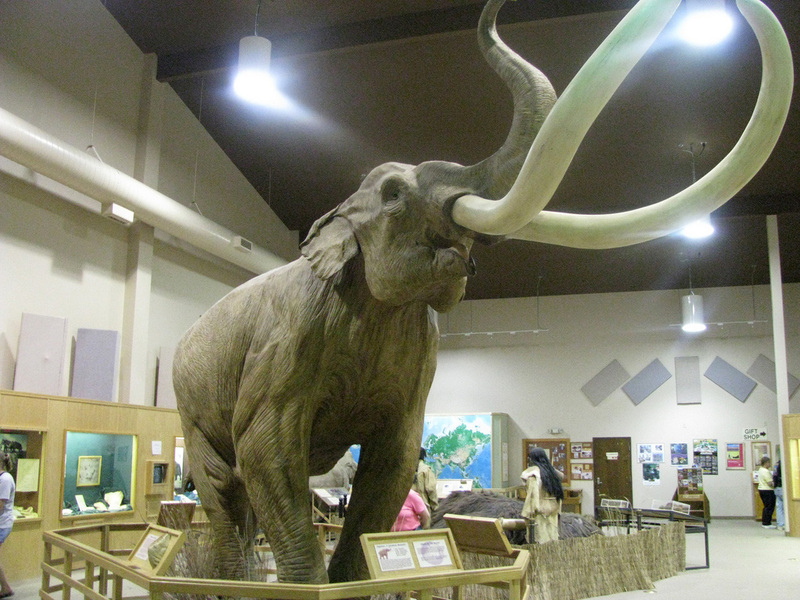 Fossilized remains of the Columbian mammoth were found on the Olympic Peninsula. Mammoths stem from an ancestral species of north African mammoth (M. africanavus) that disappeared about 3 or 4 million years ago. Descendants of these mammoths moved north and eventually covered most of Eurasia (these were M. meridionalis, the “southern mammoths"). About 1.8 million years ago, in the early Pleistocene, M. meridionalis was able to cross into North America across a temporary land bridge in the Bering Strait caused by low sea levels during an Ice Age. 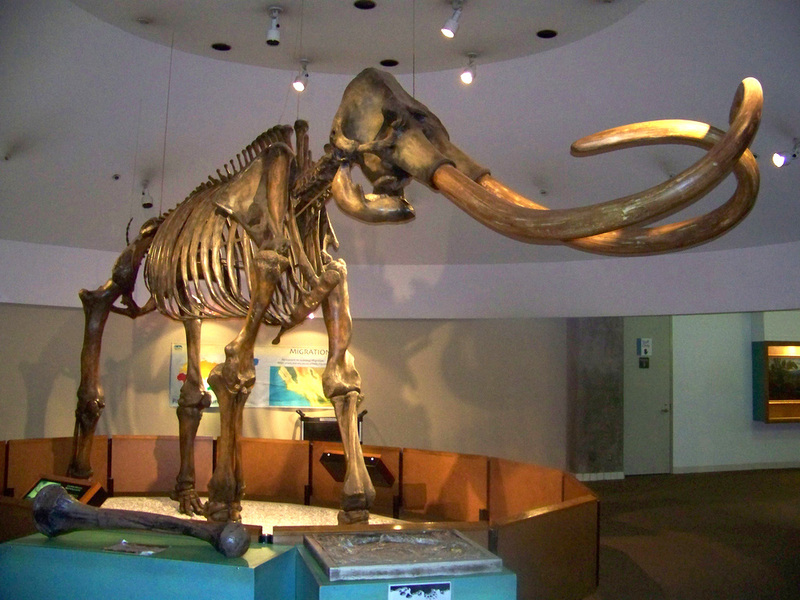 The southern mammoth then radiated throughout North America. In the Middle Pleistocene, a new North American species evolved - the imperial mammoth (M. imperator). 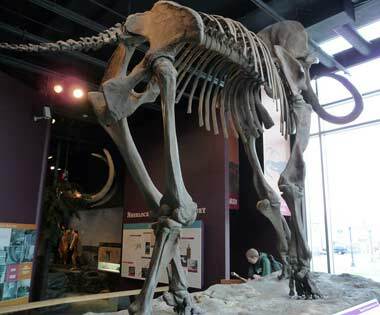 The Columbian mammoth (M. columbi ,also known as the Jefferson mammoth, M. jeffersoni) appeared in the late Pleistocene. Its range covered the present United States and as far south as Nicaragua and Honduras. Meantime another species of mammoth had developed in Eurasia - the steppe mammoth (M. trogontherii), which lived from 200,000 to 135,000 years ago. Later in the Pleistocene, the woolly mammoth (M. primigenius), made its appearance (woolly mammoths were the smallest of the mammoths, except for dwarf forms of mammoth that are known from fossils found on islands). Columbian mammoth skull in situ; photo by C.V. Vick on Flickr (noncommercial use permitted with attribution/ no derivative works). Columbian mammoth fossil; photo by Wayne Hsieh on Flickr (noncommercial use permitted with attribution / share alike). Mammoth skeleton photo by John Kannenberg on Flickr (noncommercial use permitted with attribution / no derivative works).